SUBHEAD: Climate models are more likely to underestimate than to overestimate the amount of change. Image above: Map of North America and dramatic temperature changes that could occur with business as usual under Trump plans. From original article. Leaked draft reveals a devastated America, up to 8 feet of sea level rise, 18°F Arctic warming--unless we embrace Paris climate deal. The United States faces a choice between manageable warming and unmanageable catastrophe, according to a leaked draft report by scientists from 13 federal agencies. 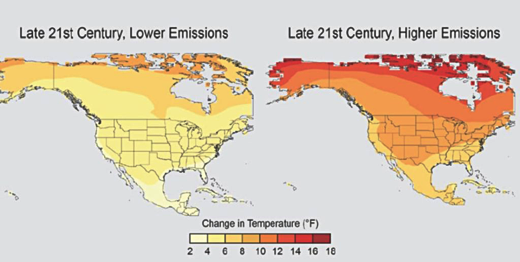 The report’s “higher emissions” scenario projects a devastating 8°F to 10°F warming over the interior of this country–and, unimaginably, upwards of 18°F over in the Arctic!–by 2071 to 2100. In that case, global sea levels could rise as much as 8 feet, inundating every major coastal city in this country and around the world. The draft, a special science section of the Congressionally-mandated quadrennial National Climate Assessment (NCA), has been given to Trump’s political appointees for review. It was reportedly leaked to the media out of concern that the report may be censored or watered down by the administration the way other climate documents have been. The NCA is the definitive statement of current and future impacts of carbon pollution on the United States. The last one was from 2014, and it made crystal clear we were running out of time to avoid catastrophe. To get to the more manageable “lower emissions” scenario, the nation and the world must far exceed the emissions reduction goals agreed to in Paris in December 2015. Leaving the Paris accord and failing to meet our commitment–as Trump intends–puts the world on track for a “higher emissions” scenario that leads to unimaginable impacts. “Emerging science regarding Antarctic ice sheet stability suggests that, for high emission scenarios, a GMSL [global mean sea level] rise exceeding 8 feet (2.4 m) by 2100 is physically possible, although the probability of such an extreme outcome cannot currently be assessed,” the report says. The bad news is that “the observed increase in global carbon emissions over the past 15-20 years has been consistent with higher scenarios.” The (somewhat) good news is that “in 2014 and 2015, emission growth rates slowed as economic growth has become less carbon-intensive. Deep in the report, the scientists spell out the choices we face concerning the Paris climate pledges, the Intended Nationally Determined Contributions (INDCs). As the chart makes clear, if we want a high probability of staying below the 2°C (3.6°F) threshold, beyond which scientists project impacts rapidly shift from dangerous to catastrophic, we will have to adopt policies that are considerably more ambitious than Paris–and we need to do that as soon as possible. With the policies President Trump has embraced–where we don’t even meet the initial Paris targets and we return to promoting fossil fuels–then we face the very realistic prospect that total warming will be 4°C (7°F) or higher. And that, as the scientific literature makes clear, would be the end of modern civilization as we know it. Furthermore, the report says that “climate models are more likely to underestimate than to overestimate the amount of long-term future change,” so there is a greater chance things will be worse than the report lays out than they will be better.